I visited Mesa Verde in Colorado near the Four Corners. This was my first encounter with the "ruins" of the ancestral Puebloan people, progenitors of the Pueblo and Hopi nations. I had heard about Mesa Verde since I was a kid, but nothing could prepare me for the awesome reality. Despite the influx of tourists, there is a peaceful and spiritual quality that persists. The cliffs were only occupied for the last two centuries at Mesa Verde; before that, all habitation was on the mesa above. At first the people made rectangular pit houses that were dug partially into the ground and then built up with poles and sticks plastered with mud. The entrance was via a hole in the roof with a ladder descending to the floor below. Archeologists believe that from this simple pit house both the freestanding masonry pueblo and the underground circular kiva evolved. 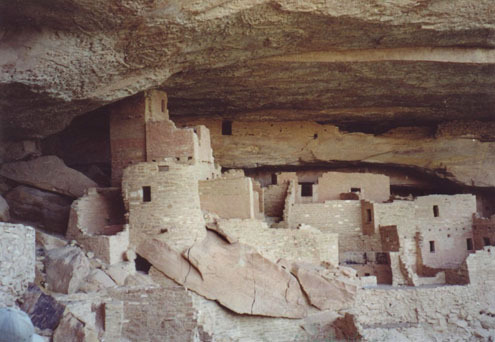 The cliff dwellings combined both interconnected pueblo "apartments" and kivas, which were used for ceremonial and community functions. Some of the larger cliff dwellings may have housed over a hundred people. Most of the Mesa Verdeans lived in this communal way, but there were also many smaller housing units scattered throughout the area. It is obvious that they were a very cooperative society. Little did they know that their style of architecture would become so enormously popular many centuries later. "Pueblo" or "Santa Fe" style building can be linked directly to them. The Spanish introduced modular adobe blocks that make the construction go faster, but the simple stacked rectangular shapes with protruding vigas is native American. 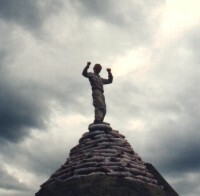 I got an indication of how well solid rock can modulate temperatures at another stop. On the outskirts of Moab, Utah is a 5,000 square foot dwelling blasted out of solid monolithic rock, called Hole-in-the-Rock. It is open for tours, so I checked it out and was informed that the temperature stays about 65 degrees F. all year round. Moab is at about 4,000 feet elevation, so it is a warmer climate than Mesa Verde, but even so the cliff dwellings must have been fairly comfortable most of the time. I couldn't help but compare what the ancestral Puebloans have achieved with what I have been advocating about sustainable architecture. They score remarkably high! The rooms are very compact, often sharing walls with each other (which makes for less transportation of building materials and the adjacent rooms help keep each other warm.) The rooms are often stacked on top of each other (I saw as many as four stories), which again conserves space, materials, and heating energy. There is very little wasted space; even the tops of the pueblos and kivas were used for community activity. 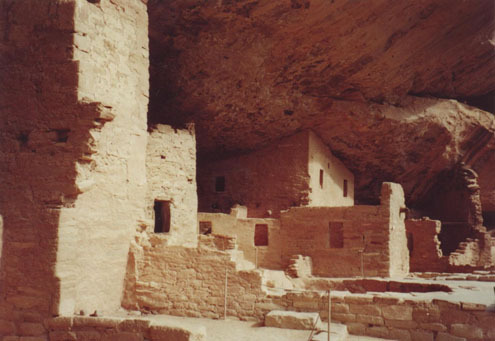 Most of the cliff dwellings were oriented to collect solar energy. Even though they didn't have glass to keep the rooms cozy, they compensated by using quite small entrances and ventilation holes, which could be sealed with slabs of rock or hides when they wanted. Being built into the cliff face, they did not overheat in the summer. Because of these factors they were relatively energy efficient, requiring less wood for heating. The materials they used to build with were definitely local and natural, being just the sandstone and adobe found in the area. Very little wood was used, just small vigas to support the floors of the various stories or the kiva roofs. What wood they did use was obviously not milled. Deforestation was likely an issue for these people, as it is for us. I'm sure they recycled building materials as there is much evidence of remodeling over time. They most certainly built to last, as much of their work has survived some seven centuries without any maintenance. The Park Service has stabilized some of the structures, but they say only about 10% of what is there now has been done since the natives left. In fact you can usually tell which work was done in modern times because it is much cruder than the original work, which was carefully carved with stone tools and then plastered to make very smooth, colorful walls. Most of the original colored plasters have not lasted. With all of this sustainability, why were they unable to sustain their culture at Mesa Verde? As I mentioned earlier, the likely cause was a prolonged drought that made it very difficult to provide food for the thousands of people living there. This could be the final message from these ancestors: ultimately we live at the mercy of mother nature. They were able to move on to other places where streams provided water for their gardens. Where could we move if our climate becomes inhospitable or we have polluted the waters or poisoned the air or our great machines cease to run?